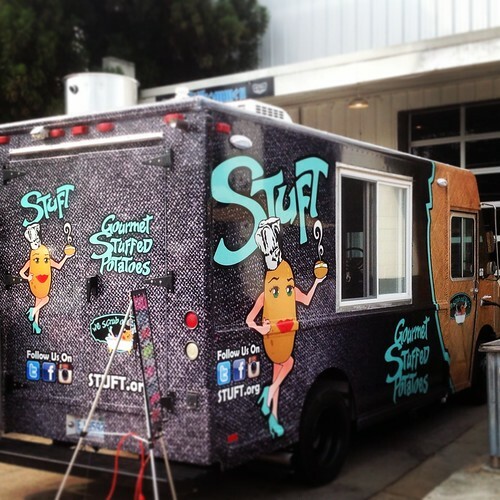 Picture of the Week: “Stuft” – The Gourmet Stuffed Potato Food Truck! Yesterday I made a quick stop at Big Boss Brewery to snap this picture of “Stuft” – a gourmet stuffed potato food truck that is relatively new on the Triangle food truck scene. I didn’t get a chance to try their menu, but I never met a carb I didn’t like and can’t wait to try some of their food soon. For more food truck action make sure you follow my friend Art over at The Wandering Sheppard. He has the scoop on all the new food trucks and shares weekly updates on the latest Food Trucks events like the upcoming Downtown Raleigh Food Truck Rodeo this Sunday from 1-6pm. Question about our food trucks in general? When is the next rodeo? Cheriarmour – The next Big Raleigh Food Truck Rodeo is this Sunday May 4th. There is also a smaller Rodeo this Friday in Carrboro and a big one Scheduled for Father’s Day in Durham! Very cool!! I will try and make it out to at least one of these! I needs tto spend soome time learning much more or working out more.